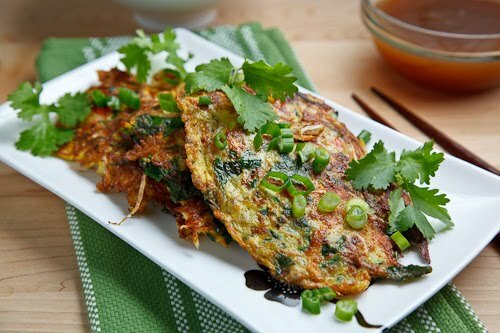 Egg foo young is a Chinese omelette that is packed full of vegetables and sometimes meat, and it is commonly served over rice and smothered in a simple and yet tasty gravy. The Chinese New Year is right around the corner and I figured that that was the perfect excuse to pull our some Chinese recipes! On the top of my list was egg foo young which is a Chinese omelette that is stuffed with vegetables, served on rice and topped with a simple and yet tasty gravy. 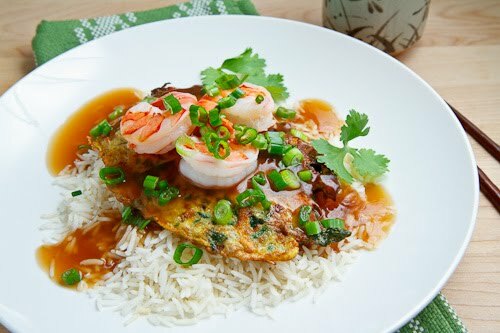 The base of egg foo young is normally vegetables and bean sprouts, cabbage, onions, water chestnuts etc. are commonly used but you can include pretty whatever vegetables you like. 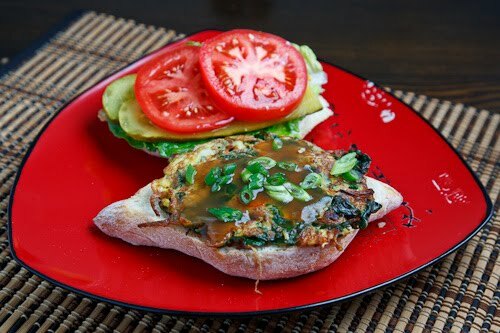 (Making egg foo young is a great way to clean out the fridge!) Meats can also be included and common ones include ham, shrimp, pork, beef and/or chicken but you can easily keep it vegetarian by sticking with just the vegetables and padding them out with mushrooms never hurts. All of the ingredients are held together by, you guessed it, eggs! Once the ‘batter’ has been made it is fried until golden brown in a pan and the cooked eggs hold everything together. You could eat the egg young foo as it is but it is usually served over rice and it is topped with a gravy made from broth that is seasoned with soy sauce among other things and it is thickened with a bit of cornstarch. 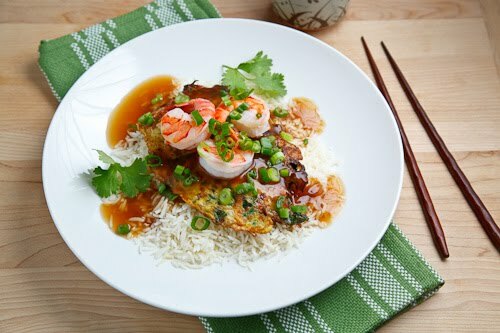 I like to garnish the egg foo young with green onions, cilantro and topping it off with some of the things that are in it makes it look all the better. 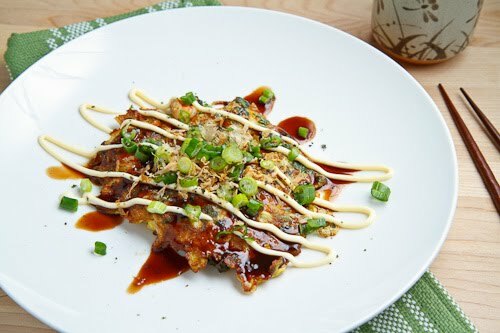 Egg foo young reminds me a lot of okonomiyaki or a Japanese pancake so I served some of my leftovers okonomiyaki style topped with okonomiyaki sauce, mayo, katsuboshi, crumbled nori and green onions for a tasty treat! Of course the leftovers are also good in a sandwich which is called St Paul’s sandwich and in addition to the egg foo young it includes lettuce, tomato, pickles and mayo. I could not resist adding some of the leftover gravy to the sandwich to add even more flavour! Mix the bean sprouts, onion, zucchini, carrot, bok choy, mushrooms, garlic, ginger and salt in a large bowl and set aside. Bring the broth to a boil, reduce the heat and simmer adding the soy sauce, rice wine and mirin. Mix the cornstarch into the water, add it to the gravy and simmer until it thickens. Mix in the sesame oil reduce the heat to low to keep it warm while you cook the omelettes. Squeeze any excess liquid from the vegetables, drain and mix with the cilantro and eggs. Pour 1/3 cup of the mixture into the pan and cook until golden brown on both sides, about 3-4 minutes per side. Note: If the egg starts to spread out, push it back in with a spatula. Serve over steamed rice and top with the gravy and extra vegetables if desired. Goodness. This looks delicious. I have a weakness for Chinese food. I will be making this. My daughter will be in heaven. She just told me tonight that as soon she has her own place she will only cook Asian food. Great recipe (like always)! I love, love, love egg foo young. I cannot wait to give this recipe a try. Your shrimp and mushroom versions look delicious. So hungry right now! Oh, that looks good. Definitely giving this one a shot. Thank you! Really appetizing! A tasty dish. Egg Foo Young in a mushroom sauce was always my absolute favorite Chinese dish when we I was a kid! My Dad used to make it as part of his "healthier, not take out" Chinese food repertoire and I ADORED it! Thank you for resurrecting this with so many ideas for toppings/serving to shake things up! Egg foo young was something my dad ALWAYS ordered when we got Chinese food. And he never let us try it. Except for the gravy. I could have drank that gravy. Can't wait to try this! Choosy Beggar Tina: Speaking of mushroom gravy, add a few dried shiitake mushrooms to the broth while simmering it to get an excellent mushroom flavour. Can't wait to try this! Thank you! So many good ideas for Egg Foo Young, Kevin. Love the photos, too. This is a keeper. I, also always feel like Chinese food around the new year. Funny, how that works. Great pics and ideas, too. Unlike any egg foo young I have ever seen. The only egg foo young I have ever seen, is a concoction of vegetables chinese style with small pieces of something resembling scrambled eggs. To me totally un appetizing…… now yours is a different story. This is one of my fave foods, but have yet to make it. THANK YOU! I think I'm making it on Sunday! Mmmm… looks delicious. Great presentation. This looks and sounds delicious plus it's an original idea for dinner. Awesome! Beautiful and I'm sure delicious! I have this on my menu for this week- I'm really looking forward to it! I've never had it before, and with just a gluten-free soy sauce switch up it's friendly for my diet. Thanks, Kevin! Mouth watering!! Must make this soon. Egg foo young has been on my bucket list. I"m pinning. You remind me that CNY can have simple dishes like this too! What a lovely attempt- and I can have this any day for dinner. I am hopelessly in love with Chinese food, but sadly do not eat it enough, something I hope to fix this year. This recipe looks like a good place to start!! Thank you! Wow. This looks so good. I love to try new recipes! I never made egg foo young so excited to try it! Kevin, I love this recipe! I've been on an egg kick lately, so any recipe involving them sounds really good to me. And of course I like how it incorporates Asian flavors! I love egg foo young. I don't know why I never think of making it at home. This may change my mind! ghgThe recipe here sound scrumptious, I am going to try a couple out this weekend for a family birthday party. love your blog. Keep on cooking. Thanks for the recipe. The sauce was great! This looks wonderful. However, I don't understand direction #5: "drain and mirin the eggs along with the cilantro." Is this where all the veggies and eggs and everything else is mixed together, or do you mix the eggs with the mirin first? TSannie: Sorry about that, that was a copy and paste error. I cleaned up the instructions in the recipe. I always order Egg Foo Young when I eat Chinese food. I haven't tried to cook my own in a long time but I'd like to try your recipe. It looks delicious! Anonymous: You drain the veggies, mix them with the egg and then cook. Enjoy! 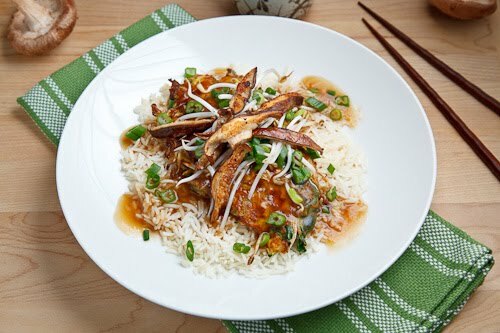 Thank You Kevin – I had the Egg Foo Young for dinner this evening and it was beyond wonderful. Thanks for the additional instruction and thank you so much for sharing. All these recipes look yummy.